I am once more faithful to dear old Almond Butter after my last little escapade with Pesto. A wild adventure with an Italian condiment is wonderful while it lasts but for every day comfort, nothing but Almond Butter will do. Well, any nut butter will do. Or Speculoos. AB has made it once again into my breakfast routine, teaming up with an old classic: fruit. 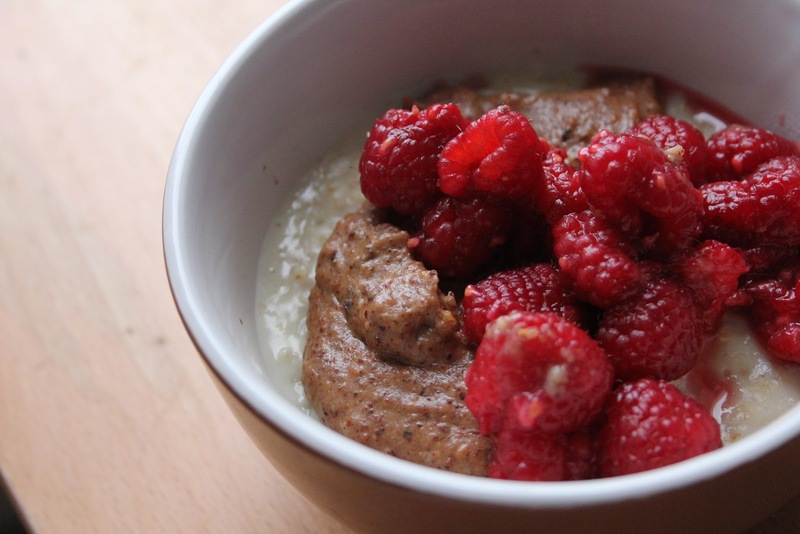 Warm raspberries + almond butter = the ‘healthier’ PB&J. Right, who cares about healthy or not, let’s just eat it ’cause it’d be criminal not to. When I first moved to England I knew zilch about porridge. Water and oats, ok, and er by the way, it looks freakin’ disgusting. But with proper sweetening it tastes very good and warms you up better than anything else on a wintry day. However it took me a long time to figure out what the right consistency of porridge was supposed to be like. I used to make it way too thick and also didn’t know how to much of it to make (the 30g serving you get when you buy prepackaged instant porridge oats is simply preposterous and should be legally banned; I now know 50g is much better, but it’s still a minimum). Now I’ve never added any salt to my porridge, but then again I often forget to add that ‘pinch’ that is required in many, many recipes, and they all turn out fine regardless. 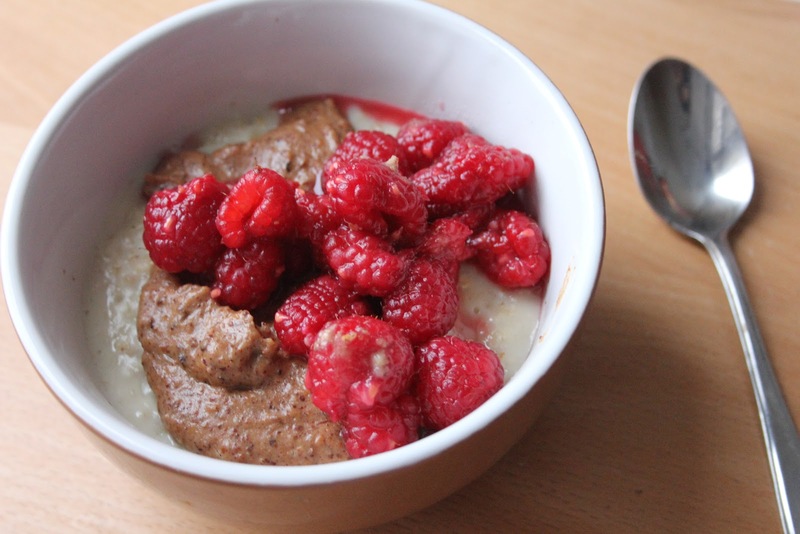 To each their own; I encourage you to experiment and discover your own perfect porridge recipe. What I do is this: I place the oats and liquid ingredients (half water, half milk) in a pan on medium heat and wait. Wait till the first bubble begins to swell, slowly, monstrously, and bursts with a deeply satisfying “plopff”. Then more and more bubbles swell and explode, and that’s when the porridge starts to thicken. You should let it erupt like this for a couple of minutes, then take it off the heat and serve immediately with your topping of choice. Remember that the porridge will thicken as it cools down, so I beg you resist the urge to add more liquid while it still cooks. Combine the hot water, almond milk and oats in a small saucepan. Place on medium heat and wait patiently until, 4 or 5 minutes later, the first bubble appears. Let the porridge gently bubble this way for 1-2 minutes while you stir (clockwise!). Add the banana, mashed or sliced, it doesn’t matter, and stir around. It sweetens the porridge and add a little more bulk. Serve in a bowl and cover with a cloth to keep it warm. Melt the almond butter either in the microwave or in a pan with a little bit of hot water to keep it from burning. Pour over the warm porridge. 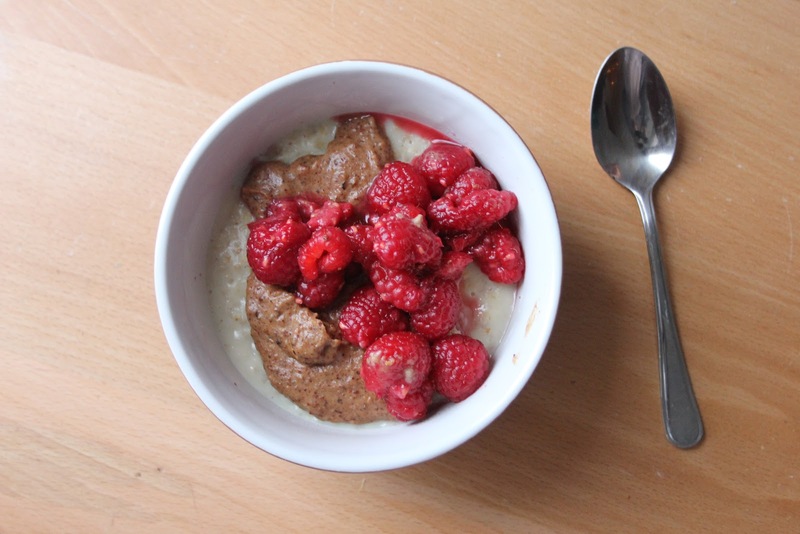 In a small saucepan (this can be the same you used for the porridge, just rinse it out) cook the raspberries in the agave syrup on medium to high heat for a couple of minutes then serve over the porridge and almond butter. If you’re like me, you enjoy your porridge mostly on misty, moody winter days, the kind where you have a Lorelai Gilmore moment and you can smell the snow before it falls. Nothing–nothing–but a big bowl of steaming porridge will comfort me then. P.S. : For the Americans… porridge is oatmeal. FYI. One thing you should add in your blog posts is where you buy your ingredients.